Not every day you get a chance to put your projects in front of the entire world of collaborators, customers, and investors. That too, on the most anticipated and widely renowned “Start-Up Pavilion”. The 13th edition of the BioAsia 2016 is finally here with the theme of ‘Leveraging India to succeed globally’. This time, it focuses on drawing plans & connecting dots for the growth of life sciences and healthcare. And for this vision’s realization, it is inviting applications from the community members of Indian Startups. Well, here is your chance to introduce your innovations to the world! Not motivated enough to apply? We here illustrate a few reasons for you to participate in this most innovative support program. 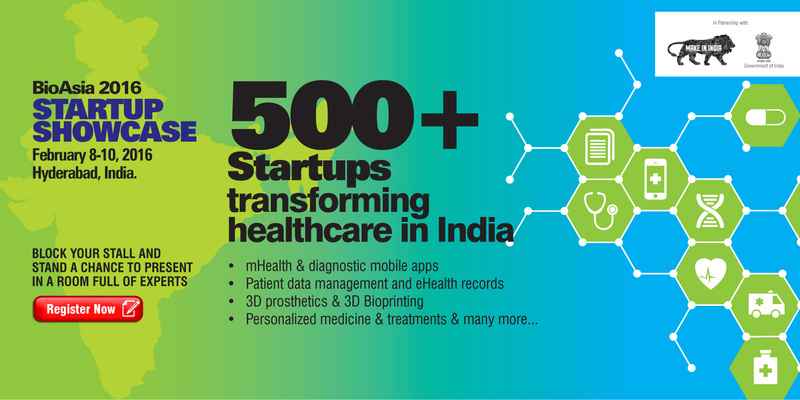 BioAsia, Asia’s largest healthcare & life sciences forum, is bringing together medical practitioners, biotech companies, telemedicine experts, PE firms, hospitals, tech companies, app developers, venture capitalists, scientists, and academicians under one roof. On selection of application, you will get a booth space to showcase your innovative technologies to prospective customers as well as investors. You will get to meet prominent names of biotech, pharma, medical and IT industry from more than 50 countries. This platform will serve you with best collaboration opportunities. This is your chance to present your project & vision to an entire room of experts. This once-in-a-lifetime opportunity will expose you to cutting-edge healthcare IT innovations, latest trends, and demands. On selection of your application, you will also be given a complimentary total convention access to the event. Those willing to become a part of the conference too will be enjoying a special discount on registration fees. The most important point, you get an opportunity to explore the city of pearls (also known as Cyberabad) and tastes of Hyderabadi delicacies. Who knows, you might even end up meeting your future business partner here. Lastly (as has already been emphasized), this is a lifetime networking opportunity to present your technologies to the world of Life Sciences. BioAsia 2016 Startup Showcase will be held from 8-10 February 2016 at Hyderabad.